Ryan Howard has been playing in Philadelphia for a long time now, and he's on contract to play a number of more years (through at least 2016 - or 2017 at the team's option). What we've seen of Howard since his contract extension was signed on a West Coast road trip back in April of 2010 hasn't been too good. Howard did set a trail on fire in the 2006-2009 seasons, he was one of only a few players that have accomplished baseball greatness, he hit 40 HRs and had 130 RBI in 4 straight seasons. It seemed like that would never end, but as we all know, all good things must end. Ryan Howard has a tear in his knee that will now force him to be out 6-8 weeks in yet another setback for his Phillies career that seemed like it was a house on fire just a few years ago. Just the way that the Phillies signed Howard to the $125M extension when they went on a West Coast road trip in 2010 sent a mixed signal to fans by Ruben Amaro and the Phillies organization. 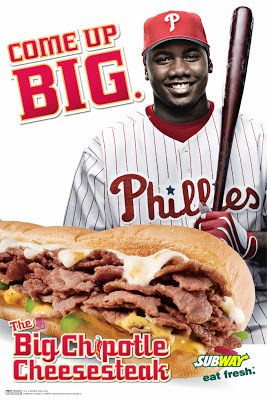 Here was a player like Howard that had accomplished so much for the team up to that point, but the Phillies chose to announce this outside of Philadelphia, about as far as you can be away from the city in fact. The locals couldn't rejoice as they would have if the deal was announced in Philadelphia. This contract extension that Howard signed didn't take effect until the 2012 season, before that Howard had inked a $54M three year deal with Phillies that ran through 2011 and covered the '09-'11 seasons had the Phillies waited until the middle or end of that contract, I don't think we would have saw them throwing a bunch of money at Ryan Howard. Signing Howard again in the middle of his then $54M contract made no sense, unless of course he just keep up that torrid pace of HR's and RBI's that Howard appeared to be able to do. That was not what happened though, and Ryan Howard hasn't been the same player since he signed the big $125M deal and certainly not a player worth that kind of contract extension. Baseball is a team game, it's not about the signing of one player that's going to lead you into the World Series. The Phillies have been trying to sign those 'one player' type of superstars for the past couple years now with the addition of 4 pitching aces one year, and then keeping 3 aces on the team ever since, but that has been proven to be a bust. The NY Yankees are another example of a team just throwing money at free agents to build a winning team, they haven't been that successful at this either. Cliff Lee announced that he wanted to be on a "winning team" a couple of days ago to the press. That was a signal that he just isn't happy playing for the Phillies anymore because they aren't winning. As a GM, your job has to be to balance out a team not simply stack the deck with superstars. Move a Cliff Lee, but get someone great in return for him, someone that will make an impact on this team.